I mentioned before that I have been haunting farmers’ markets and tag sales this summer, but I have also been seeking out art fairs to see what type of artists are out and about these days and make notes for my own future career as a professional artist. A couple of weeks ago I was very pleased to have stopped by the annual summer art show sponsored by ACT! (the Arts Council of Tamworth) in the quaint New Hampshire community of Chocorua Village. The show featured a wonderful collection of local artist working in all manner of media. 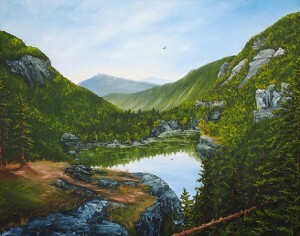 I was particularly attracted to the work of young artist Jessica L. Fligg, who was showing her paintings, prints and photography showcasing the natural beauty of the New Hampshire mountains. In talking with Ms. Fligg, I was very impressed with her approach. She is not only a talented artist, she is somewhat of a visual historian. She collects old books and vintage images of the various natural sites around the area and then tries to locate the spot where the original artist or photographer worked from and paint it in its current state. This method results in some wonderful pieces which come complete with a back story. I purchased a print of an oil painting titled “Crawford Notch in Times Past.” The scene comes from a photograph from the late 1800’s that Ms. Fligg found. She located the spot from where the photo was taken and created her painting as a mash-up of the original view and what it looks like today. I purchased the print because I liked it, but also because of the passion with which the artists works and shared with me in our conversation. I look forward to watching this artist grow in the future. If her current work is any guide, she is sure to become a cherished New Hampshire artist for years to come. Check out the print I purchased as well as other paintings by New Hampshire artist Jessica L. Fligg here. One look at Genesee River’s home page let us know we had stumbled upon a site that fit perfectly with our sensibility. 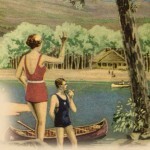 The main graphic on the page is a vintage lakeside print, complete with canoes and a gentleman smoking a pipe. Awesome! This first impression was reinforced with a tour of the site, where Genesee River helps “people get a little bit closer to nature” with their well-curated collection of old and new products for decorating your home. About Genesee River: “Since 1985, we have dealt in rustic, both new pieces of our design as well as select vintage items. A chance encounter with an Amish builder of bent hickory furniture set the wheels in motion. When combined with antique finishes we built the foundation of what is today known as ‘Genesee Style‘”. There are some cool things offered by Genesee, but of course we were drawn to the fine vintage collection. See the Genesee River collection for yourself here. Go straight the the Genesee River vintage collection here. Lost Cowboy is powered by	WordPress 5.0.4 and delivered to you in 0.822 seconds using 42 queries.